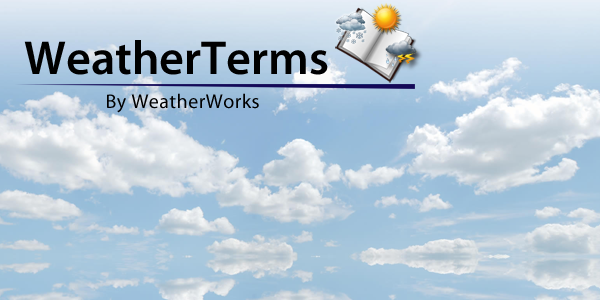 Simply put, fronts are boundaries that form barriers between two distinct air masses of different temperature and/or moisture content. When cold (and usually drier) air is moving towards the warm air, the boundary is referred to as a "cold front." On the other hand, when warmer and more humid air is moving towards a cooler air mass, the boundary is called a "warm front." Sometimes neither of these air masses move much, in which case the boundary is referred to as a "stationary front." Most of the time, a cold front will be associated with a warm front and a parent low pressure center. In these regards, the whole entity can be thought of as a "frontal system," which is usually associated with inclement or stormy weather. Cold front and warm front graphics via NWS/NOAA. Although both varieties of fronts are associated with precipitation, both the type and intensity of precipitation can vary greatly across a frontal system. 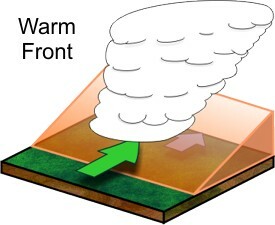 In the case of a warm front, precipitation usually occurs near or out ahead of the boundary, as warm moist air gradually rises above the colder and denser air mass already in place. Additionally, the slope, or steepness of a warm front is generally gradual in nature - which results in mainly light to moderate precipitation. In a cold front, however, the slope is much greater, and as a result causes the air to rise faster and make the environment more unstable. 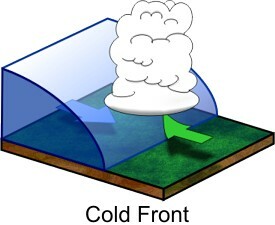 Because of this, cold fronts are usually associated with heavy precipitation, including strong to severe thunderstorms.